I spent a decade of my most formative years planting trees in the Canadian Wilderness. Those summers in the north introduced me to logging communities remote from my urban Toronto life. I even wrote a paper on traditional logging poetry for my MA in comparative literature. More than twenty years later, after I’d published several feature articles on the war in Iraq for The Walrus, Antonio DeLuca, the hot young Art Director in those days, asked me: “If you could choose any story to do in Canada, what would it be”? 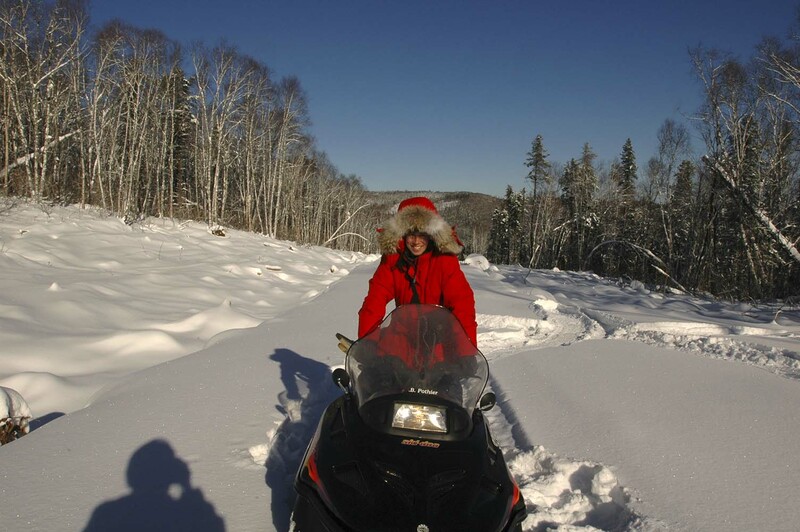 Without hesitation I said, “winter logging in Quebec”—winter because it would be visually beautiful and because most readers wouldn’t imagine that one of the most vigorous logging seasons is the dead of winter when the frozen ground can sustain heavy machinery. Logging outfits are wary of journalists, so I knew I would have a task ahead of me just to gain access. As it happened, my brother-in-law Daniel Lavoie’s brother-in-law Blaise Parent worked for the Quebec Ministry of Forests and was willing to help. He introduced me to the Press Secretary at Abitibi Consolidated, one of the most important logging companies in Canada. The biggest concern of any logging operation is safety. Later I was told that they figured if I knew how to handle myself in a war zone I could be trusted on a logging site. Antonio and I won a Design Club of Canada Gold Medal for the story when it was first published in 2007. The editor called it “The Last Lumberjacks,” which I wasn’t too happy about; but I guess it was catchy. I’m renaming the work “The New Lumberjacks,” to reflect the continued work of logging in Canada and the men who have adapted to mechanization and modern sustainable logging to keep our forests both economically and environmentally prosperous. I have re-visited and re-mastered my photographs from Camp Vermillon into a series of composite images, collaborating once again with master printer Bob Carnie and the Stephen Bulger Gallery to make the images available as collectible prints. The “kaleidoscope landscapes” are about my memories of the landscape, more like a dream than a straight photograph. The convergence of the mirrored images is where memory meets imagination and takes me back not just to Vermillon but to the hundreds of logging cut-overs I traversed in my years planting trees in the Canadian forest. Abitibi-Consolidated’s Camp Vermillon is located 50 kilometers down a private logging road west of the town of La Tuque and the Vermillon River in the Mauricie region of central Quebec. It is one of the largest of the province’s 200-odd logging camps. The 150 men who work the site have come a long way from their profession’s roots. These days, they’re not loggers so much as mechanics, drivers, and machine operators. Twelve-hour shifts go on nearly year-round, pausing only for two months in the spring, when the winter thaw makes the land too soft and wet for machines to maneuver. Marion’s violin speaks to the traditional, romantic image of the Canadian logger—the rugged individualist who communes with nature and his fellow man. Logging began to move away from this romantic ideal with the advent of the chainsaw in the 1920s, the watershed moment of a technological shift that saw trees cut down in far greater numbers than ever before. This change, combined with the Depression, put thousands of traditional loggers out of work by the 1940s. Since then, the technology has become even more advanced and expensive: a $500,000 feller-buncher is capable of felling more than 2,000 trees per day. Almost all of the men at Camp Vermillon started out in the chainsaw era. Most of their fathers and grandfathers were loggers. While they take great pride in their profession and its traditions, few want their sons to follow in their footsteps. Yet the lure of life in the forest remains. The landscape has a silent, isolated quality that verges, even amid the big machines, on the serene. Asked what drew him to work in the woods, thirty-nine-year veteran Jean Paquin said matter-of-factly: “C’est la liberté” (the freedom of course! ).